We all agree that questioning is useful, but it is also problematic. How do we ensure that our questions both check on learning and understanding and encourage innovative thinking? How do we make sure we do not always go to the same students, who will give useful, clear answers? How do we stretch our students’ thinking with open questions? 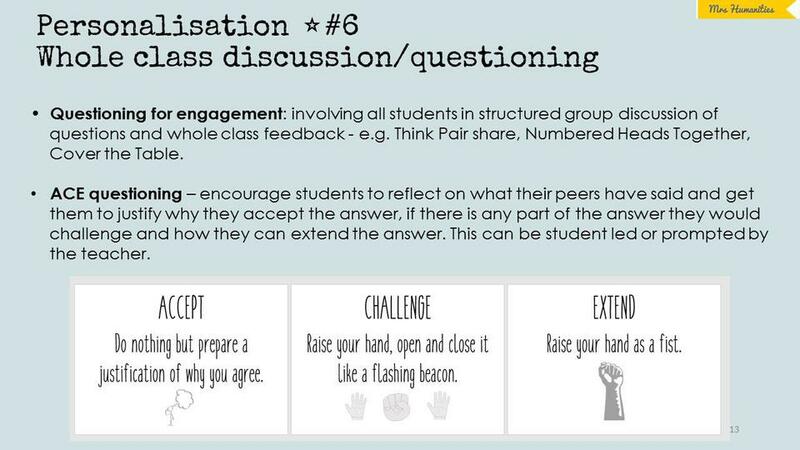 How do we ensure that half the class is not snoozing through their classmates’ discussion? How do we challenge ourselves never to accept wrong answers because we are afraid of dampening a student’s enthusiasm? One key answer is to plan our questions. Accept, Challenge, Extend: Each student must listen to the first answer, and choose whether to Accept it (preparing a justification for why it is right), Challenge it (raise a fist, ready to put the other side of the argument), or Extend it (raise an open hand). Year 8 love this one! Note down the key questions we want to ask on our planning: deciding which question stems will elicit the higher order responses, and focus on these. Blooms / SOLO Taxonomy question stems can be useful for this. 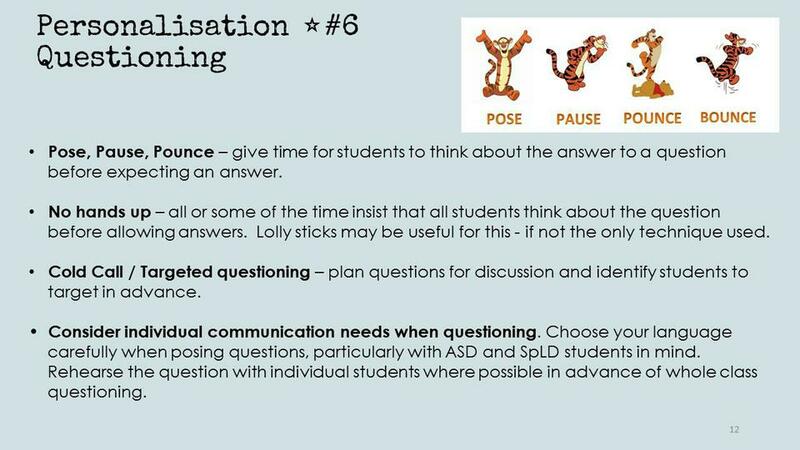 Plan specific Questioning for Engagement activities to create formal opportunities for discussion and deeper questioning which involve all students. We are planning to set up new Learning Triads this summer, to enhance our collaborative professional development, and our first focus will be on questioning. Which new methods might you try? Which of your favourite methods will you model and share for others? Please do explore these ideas in more depth in our shared Teaching and Learning Folder on the school’s Google Drive. We look forward to learning deeper questioning techniques from each other over the next few weeks this term! 'What is Formative Assessment' by Shirley Clarke (15th May 2017) Must read summary of Formative Assessment.